The USDA will release its updated US and world balance sheets next week, and on the margin, world grain production is expected to be lowered – and perhaps by a sizeable margin. The graphics below display updated vegetation health compared to last year, with crop areas isolated, and a lack of soil moisture has taken a toll on crop conditions across Ukraine, Canada and China, and of course the US. 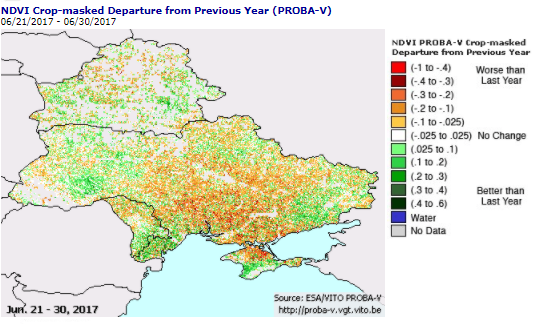 Ukraine is above, and across its Central Corn Belt, vegetation health is in places much worse than a year ago. Just this week, Ukraine’s ag body lowered total grain production to a level 18% below last year, which follows the general trend of recent weeks. And of course severe drought conditions don’t simply end at the US-Canadian border, but rather much of Saskatchewan has seen declines in soil moisture since late winter, much like the Dakotas, and now Canadian high protein wheat production is in jeopardy of falling 5-6 million tonnes below last year’s crop, further exacerbating North American wheat supply tightness. Expanding dryness in China has been largely under the market’s radar, but there, too, conditions are getting worse, not better. A rather warm/dry pattern lies in the offing for China’s Northern Plains over the next 10 days, which in turn may accelerate China’s decline in corn & wheat ending stocks. It’s all supply still – the market lacks a meaningful demand driver – but the point is that major exporters’ grain production may be lowered some 10-15 million tonnes in the USDA’s July or August WASDE releases, and falling major exporter supplies are not bearish relative to current prices. A seasonal peak is due in late summer, but our work suggests additional upside risk exists.